I mentioned that the updates about our early 1965 Mustang K Code Convertible would be more frequent, and I have another one for you today! These images show the procedure of painting the under side of the body/floor pans. You can see that the seam sealer was applied. A black sealer was then applied with a smaller spray gun to reach in the various seams. After this, this same black sealer was applied to the entire under body area. The gloss black was then applied, and after that the Poppy Red body color "overspray" was applied. We were very pleased with the results. Our next update will show the black out of the engine compartment along with the painting of the rear wheel well area. Super Savings on Disc Brake Conversion Kits for your Classic Mustang! We have always handled the Stainless Steel Brakes Corporation (SSBC) Front Drum to Disc Brake Conversion Kits. The kits consist of brand new components, are complete and fit great. Yeah, you can probably save a few dollars going with some mis-matched stuff, but it is not worth it. We have calls everyday with customers having problems with matching up parts on some other kits. 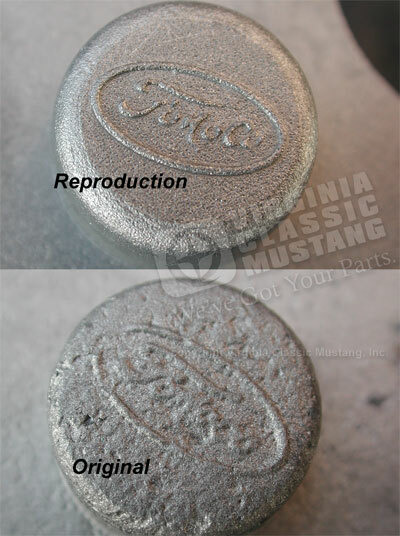 If you have been looking to upgrade your drum brakes on your Classic Mustang, now is the time to do it! For purchases made through April 15, 2010, you can get a rebate from SSBC (the manufacturer) for up to $175.00!!! We already have some great prices on these kits, so if you tack on this rebate, it is a super deal. BK146 65-66 Front Drum to Disc Brake Conversion Kit with Single Reservoir Original Style Master Cylinder $150.00 Rebate! BK147 67-69 Non-Power Front Drum to Disc Brake Conversion Kit $150.00 Rebate! BK1471 67-69 Front Power Disc Brake Conversion Kit with Auto Trans $175.00 Rebate! 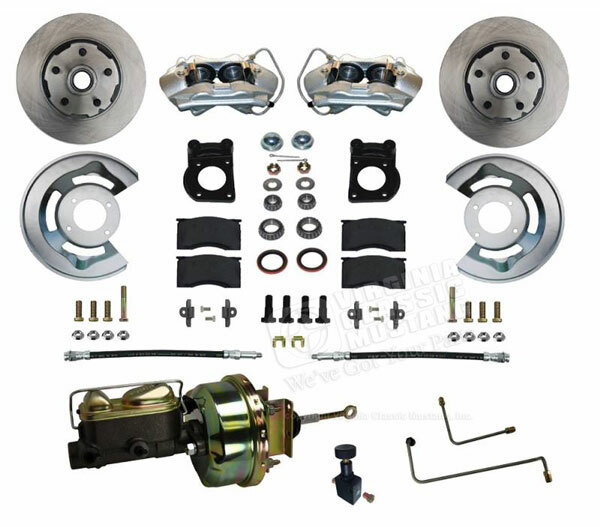 BK1472 67-69 Front Power Disc Brake Conversion Kit with Manual Trans $175.00 Rebate! BK338 65-66 Front Drum to Disc Brake Conversion Kit with Dual Reservoir Master Cylinder $150.00 Rebate! BK339 65-66 Front Drum to Disc Conversion Kit V8 Power Booster with Dual Reservoir Master Cylinder *Auto Trans Only* $150.00 Rebate! BK343 65-73 Rear Drum to Disc Conversion Kit - 28 Spline Rear - V8 Only $75.00 Rebate! BK344 70-73 Non-Power Drum to Disc Conversion Kit 6 Cyl and V8 $150.00 Rebate! BK345 68-73 Rear Drum to Disc Conversion Kit-9" 31 Spline $75.00 Rebate! BK381 65-66 6 Cylinder Front Drum to Disc Brake Conversion Kit - We have a new low price and there is a $100.00 Rebate! BK382 65-66 Front Drum to Disc Conversion Kit-6 Cylinder-Power Booster with Dual Reservoir Master Cylinder *Auto Trans Only* - We have a new low price and there is a $150.00 Rebate! Here is another cool, new part that just arrived. 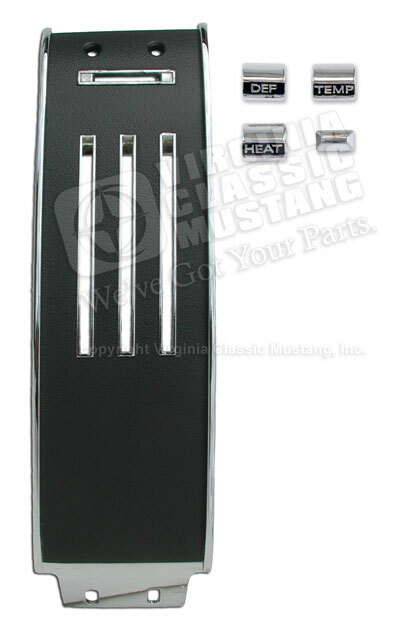 It is the metal, chrome bezel that fits over the heater controls on the 67 Mustang. It features nice chrome with the correct camera case black finish. It also includes the heater, defroster, temperature and fan knobs. 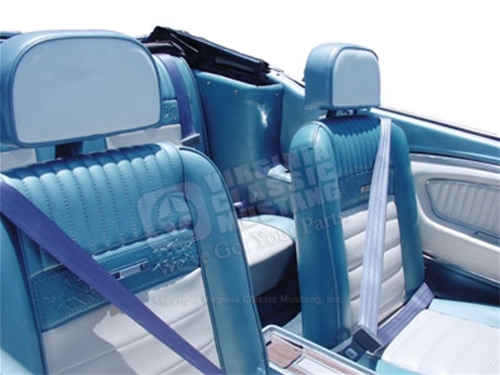 This part is for non-air conditioning equipped 67 Mustangs only. 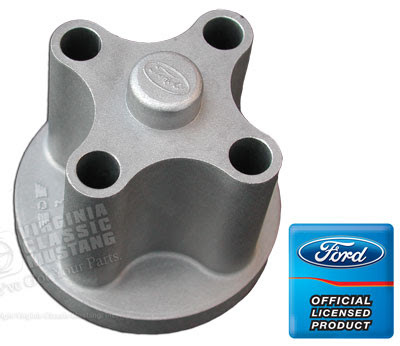 A few months ago, we posted about our new 65-66 High Performance Mustang Fan Spacers. We got a few spacers in from the first small run. The response was overwhelmingly positive. This part is really a quality piece, and we were so pleased that we could get it reproduced with the proper little details. The larger run just came in, so we will be filling all of those orders for our customers that have been patiently waiting for this part. This unique fan spacer was originally installed on all 1965-66 K Code / 289 High Performance equipped Mustangs, which, of course, also included the 65-66 GT350 Shelbys. It is the original length which properly places the fan at the opening of the fan shroud allowing air to be drawn in. So often, the wrong spacer is used and the fan is place too far inside the shroud. This does not allow the fan to do its job. We decided to pursue this project after seeing the lack of availability of the original spacers. Along with the lack of availability, the prices on originals were as high as $300.00 and many of the originals are just badly pitted. This spacer, of course, will work on any small block Ford with a non-clutch style fan. It is also, of course, a great compliment to our High Performance Fan. If you have been reading our Blog, you know that we have been posting fairly regular updates of the progress on the restoration of our 1965 K Code Mustang Convertible. The updates will soon have more cool stuff to actually look at, rather than just getting the body in shape. The bodywork has been completed, and we now have some color!!! In case you have not been following along, this is an August 1964 production 289 High Performance equipped Mustang Converible. It was originally Poppy Red, and we are restoring it back to that original color. The slideshow shows that the floor has been painted Poppy Red. I know, a bit overkill, but we wanted to put a top coat on the floor, rather than just primer. Besides, the interior floors were originally painted body color. This nice top coat will later be covered with sound deadener and, of course, carpet. Also shown is a shot from under the dash. The very dark red primer was matched here and in the rear in the area that the power top motor is located. You will also note an image of a partially painted hood. That's our "real world" test panel for the Poppy Red paint. It turned out good, so it is a "go!" This week, the proper interior white paint will be shot on the dash. 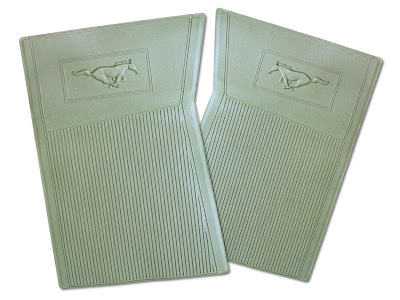 It is interesting to note that the 1964 1/2 Mustangs along with the 1965 Models (even the later production 1965 Mustangs) had a different sunvisor tip than the later models. These 64 1/2-65 models had an "open ended" sunvisor tip. All of the other models had the common "closed ended" tip. We have not had these early open ended versions for over 20 years, but we now have them in stock. 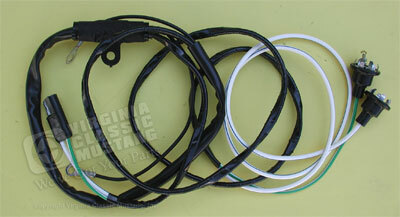 We now have a nice clip set for the 67 and 68 Mustang Hood Turn Signal Wiring Harness. 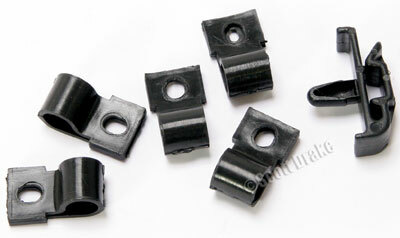 The clips are made of ABS plastic and are our part number ER6311. 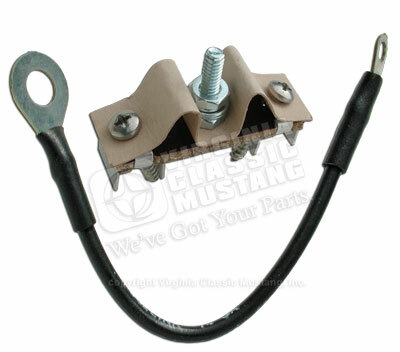 The Rear Leaf Spring Assemblies are very common parts that need replacement on Mustangs. 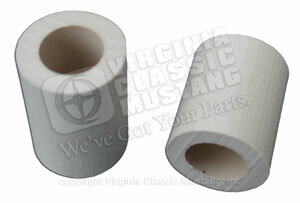 They are actually one of our best selling parts. 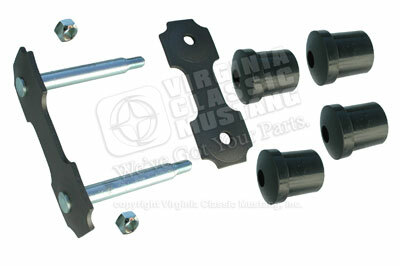 When these are replaced, the rear spring shackle kits always need replacement also. They are always rusty and the end of the rods almost always snap off when the lock nut is removed. 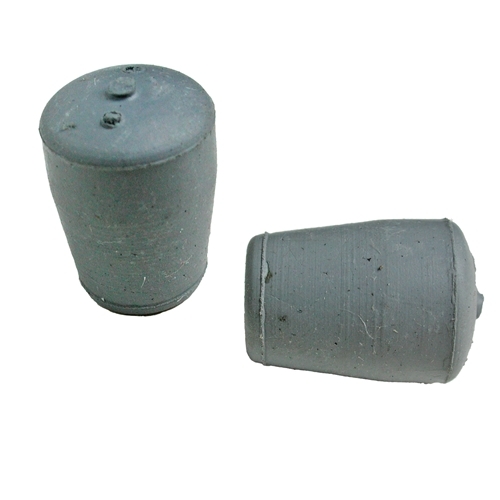 Not to mention that the bushing are always shot. 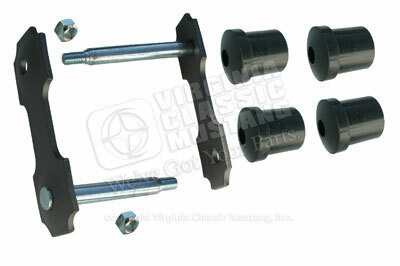 We have some very nice rear spring shackle assemblies to offer for your vintage Mustang. The most common kit is our SU43. 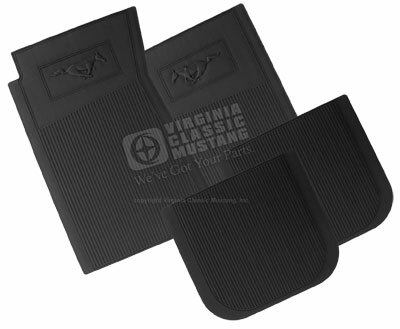 This kit, like all of our kits, will fit all Mustangs from 1964 1/2-73. It features 9/16 inch rods (not sure why Ford later went to the smaller 1/2 inch rods later.) This is our most popular and our recommended kit. We now have two new shackle kits. One is an "offset" kit. The top image in this post show this kit. 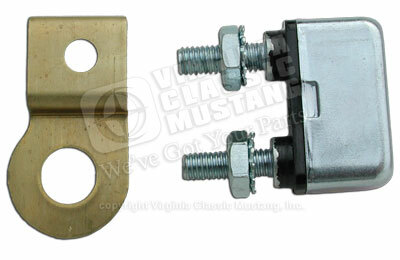 This style of rear spring shackle appeared on many Mustangs and Shelbys equipped with factory dual exhaust sometime in 1966. The configuration allows easier installation on the left side where the exhaust is close to the shackle. It was originally found only on the left side. This is our SU435 kit. Keep in mind that this kit will fit either side. It is just easier to install. If you would like to use it like the original 66-up cars with factory dual exhaust, you can use our new SU434 kit with it on the right side. Both of the SU434 and SU435 kits have the 1/2 inch rods. I know that all of this seems a bit confusing, but keep in mind that all three of these kits will fit any 64 1/2-73 Mustang model. Let us know if you have any questions! I think that this one has been out for a little while, but I just saw it. It's not a vintage Mustang, but it is just an awesome video! Image showing the nice detail just like the original on the top on the front mat. 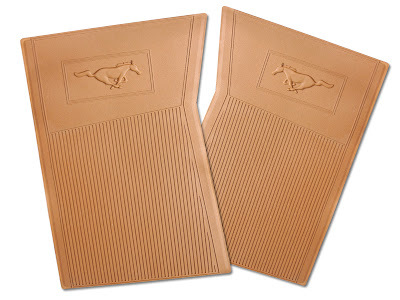 What is the most popular and useful accessory for your Mustang? 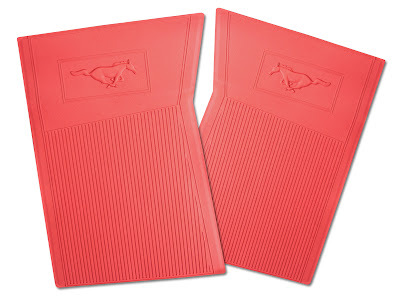 I would say the rubber Pony Floor Mats. 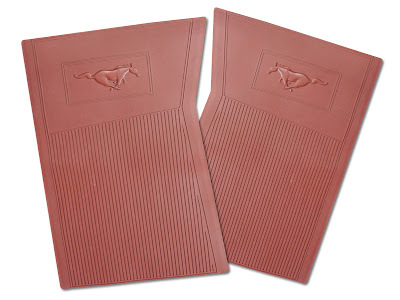 These mats were available for your Mustang when it was brand new right from Ford. There is more than one reproduction on the market. We are pleased to handle the Scott Drake brand, and think that they are far superior to the others. They are sold in sets of 4 (front and rear included.) The below pictures just show the fronts to give you an idea of the colors available.